In the App market, you will find many Screen recorders that have the capability to capture Android screen. But not of them have the capability to record screen with Internal audio. There are few trustable screen recorders that allow recording screen with Android system sound which I’m going to highlight here. Also, I will show you how you can configure a screen recorder to capture internal sound along with the screen. Sometimes, the configuration in screen recorder not set by default to record internal audio. And to check this thing out, you need to look in the settings of your screen recorder. Well, let me actually help you in that so you will be easily able to record Android screen with Internal Audio. Mobizen is not only very popular for capturing high-quality videos, but it is also very famous for recording gameplay and Internal audio. With Mobizen Screen recorder, you can easily record screen with Internal audio. Even more, it is the best convenient screen recording app recommended by thousands of creators. You don’t need any extra skill and advance knowledge to get started with Mobizen screen recorder on your Android. I highly suggest using this screen recorder over others to capture Android screen along with Internal audio in Android. Moreover, Mobizen has more to offer for Samsung Android phone users. It has a different screen recorder available for especially Samsung mobile users. And when you use that specific screen recorder then you will much more likely to record Screen and Internal audio with ease. Today, Du Screen Recorder is leading in the field of best screen recording app. And it deserves it because it’s providing every possible feature that a creator need to create perfect video. From Video making to live to stream, it will help you with its powerful technology. And all these features provided by Du Screen Recorder for free in their app. 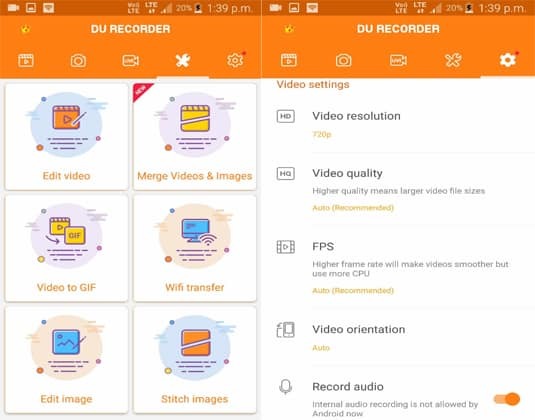 With Du Screen Recorder, you can set your own quality to record Android screen. And you will also welcome from Du Screen Recorder to change the recording settings. And the best part is you can record Internal audio while capturing the Android screen. Also, I highly recommend trying this screen recorder if you have a budget smartphone because it doesn’t require high-end phones to record screen with Internal audio. AZ Screen Recorder is also very fantastic for recording screen in a Non-rooted Android phone. It made by hecorat and has downloads of over 10,000,000 since it was released on the Google Play Store. AZ Screen Recorder can only run in Android 5.0 and above, if you use it in your KitKat or Jellybean Android phone, it will not work. 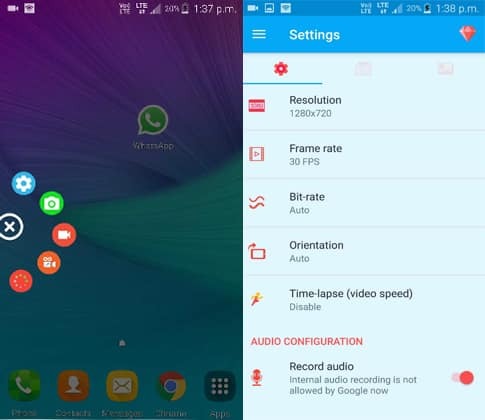 As it requires high Android version, it also records screen in high quality with Internal audio. By default, it doesn’t record internal audio unless you go in the settings and enable the Internal Audio recording option. To find more Screen Recorder which also records internal audio, you can check Best Screen Recorders that also record Internal Audio. First, download and install Mobizen Screen Recorder on your Android, install this version if you have a Samsung phone. Open it up and let it optimize for your Android phone. It’s a one-time process. Once optimization complete, click on the Mobizen floating icon from right side screen and click on the menu icon. Now, tap on the gear icon from the top area. Once you tap on the Gear icon, you will be able to see Video settings, Clean Recording Mode, Sound, and more. Click on the Sound option and under the options press on Internal. Now, internet sound recording has been set in the Mobizen screen recorder. Just below you will see Sound wizard option, enable it also because some apps and games sound doesn’t get recording due to some issue. And enabling the Sound wizard will fix that issue. Now, start capturing and sharing your knowledge in the video with Internal audio. 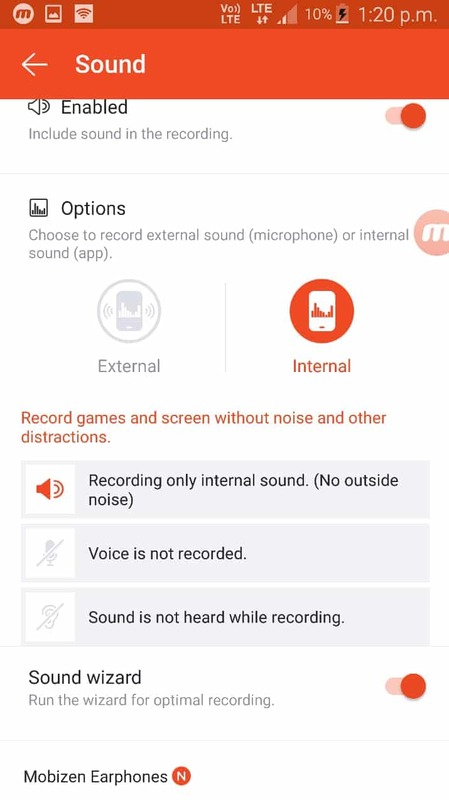 Mobizen has a feature that fixes sound recording issue that most screen recording still doesn’t has that prevent to get the apps and games sound recorded. And that’s the reason why I highly recommend it to those who want to record their Android screen with Internal Audio. In Mobizen, you may not see that notification but you may see that in its next version and build. You always have the power to in these screen recorders to record internal sound or Not. You can anytime enable and disable it, and Google doesn’t allow it because of some harmful effect on Privacy. To record Internal audio using these Screen recorders, you don’t need to have a rooted Android phone. Just install any screen recorder that I listed above and start recording your screen with Internal Audio. Mobizen Screen Recorder is definitely perfect for you and everyone who wants to record their Android screen along with Internal Audio. And I highly Recommend to everyone to use Mobizen Screen recorder because it’s perfect for every type of recording. Also, it provides a specific screen recorder for Samsung Android phones user. 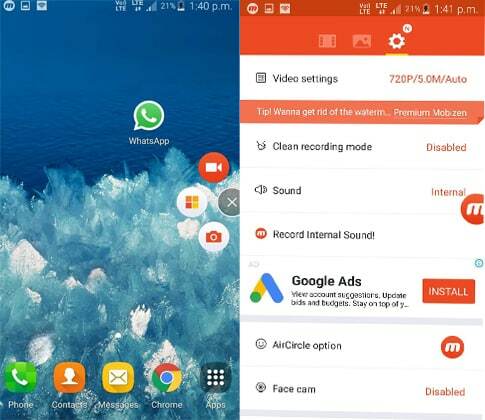 If you have a Samsung Android phone and you are looking for a screen recorder then I highly suggest going with Mobizen Screen Recorder for Samsung. It’s free and available on Google Play Store. Mobizen also doesn’t require higher Android version like other screen recorders require. It supports Android KitKat and all the upper Android version. Hopefully, you liked this article and helped you in recording screen in your Android phone with Internal Audio? If so, share it with your friends who really need Screen Recorder with Internal audio. Also, I will like to hear your opinion in the comment section below. Thanks.